The world is in fear that the natural resources may come to an end in the next fifty years. For this, we need to use the renewable energy for completing our needs. With the world heavily dependent on the technology, a recent news has stated that an artificial island would be built in the North Sea, which is near to the coast of England. The island is supposed to be a home for millions and would have everything ranging from airport to fuel supply. The concept of artificial island is a quite surprise for the common mass as they are used to watch this in the sci-fi movies. But when this is taking place in reality, this is really exceptional. The island is supposed to be built in the large sandbank of Dogger Bank which is 62 miles off the east coast. 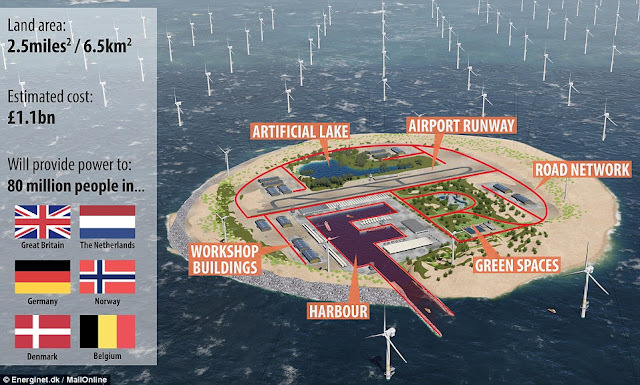 The island will be fitted with windmills which can supply lots of power to the Northern countries of Europe such as Britain, Denmark, Germany, Dutch to name a few. The wind turbines can help to compensate the power supply in these European countries. The project will be signed on 23rd of this month. The Danish farm named Energinet.dk is taking the responsibility to make this project come true of constructing the famous artificial island in the real world. This will be an incredible step towards the power supply in the years to come for many countries. The German farm is jointly working with the Dutch farm to make this happen. Once the electricity is generated from the wind turbines in the fake island, this can be supplied to different homes in and around Europe. The world is currently facing the threat of the extinction of the natural resources which in a way can put the lives of human lives in grave danger. For this, the Dutch farm and the German farm are trying their best to expand the power supply chain in the cross border countries. They have great experiences in the on-shore wind energy. So they are trying to explore what has not been done earlier by building a artificial island with huge number of wind turbines which can produce tons of electricity and light up millions of homes and industries in the Northern countries of Europe. The artificial island has the perfect location and the environment for the production of electricity. Well, the Transmission System Operators are the leading members for this project and it is quite obvious they are the best suited. They would work with other Dutch colleagues in the most efficient manner so that the project gets completed at the earliest. The future is quite bright with the completion of the project. This is a great step towards saving the resources as well using the technology which will serve as a benefit for numerous countries. The power bank artificial islandwill surely going to be source of light for millions of people.